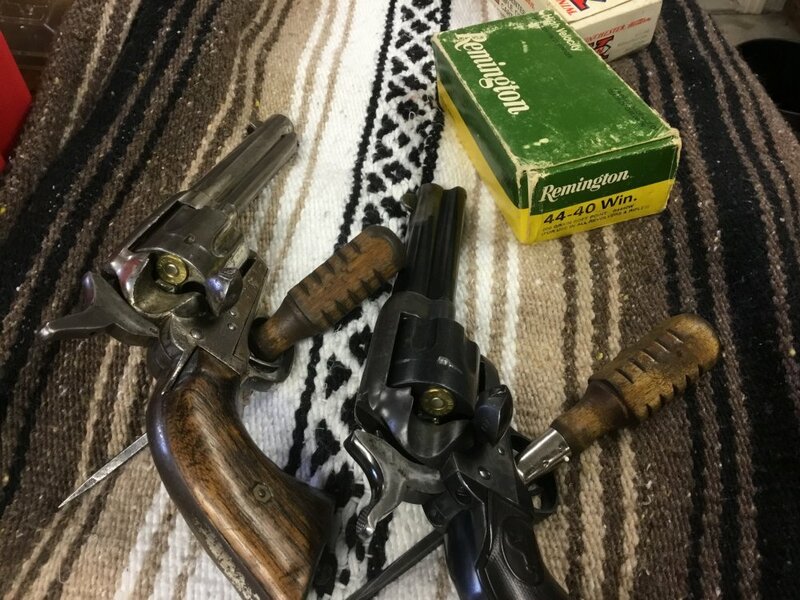 Check out the pictures of an old pistol that I got from a friend. It had been passed down to him and his brothers from a grandfather as a toy. It took some “rejuvenating” to get it working again since it had been played with hard over many years. It has Colt patent markings on the left side of the frame just like a Colt would. No other marking on the frame but the serial number, 6622. On the barrel it is marked: “SISTEM Manufacturans ANIT & CHAR E.C.E.” The caliber is 44-40 but it’s not marked as such anywhere. The frame and grip-frame are all one piece like a ‘58 Remington and the trigger guard detaches in a fashion similar to the Remington. 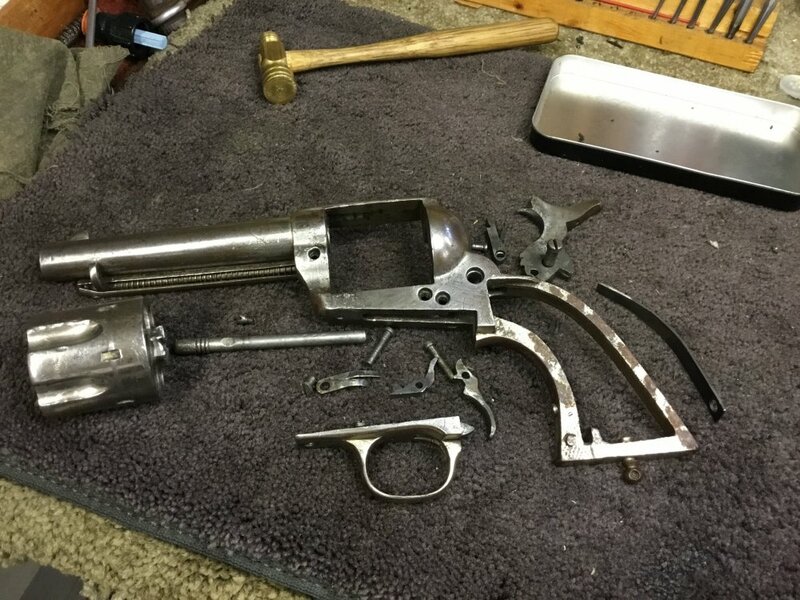 All of the internal parts are very similar to a Colt, but not identical. The gun is a little loose but locks up well. I have fired it with light loads. Not very accurate but it works! The posted pictures show both sides, a top view (lettering not very visible), and a disassembled view. 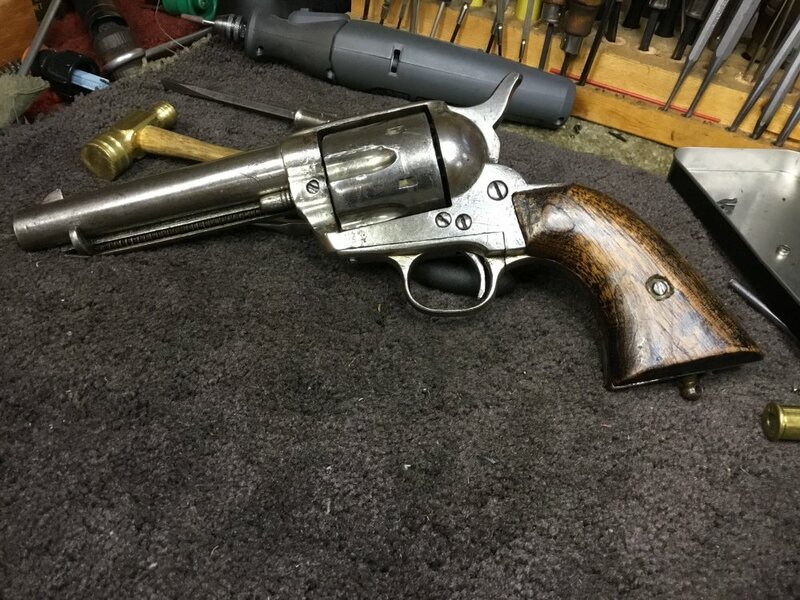 If anyone can help with info about this gun, please let me know. Gun shop we frequent got one in and it went out pretty fast. I don't remember the price he had on it. 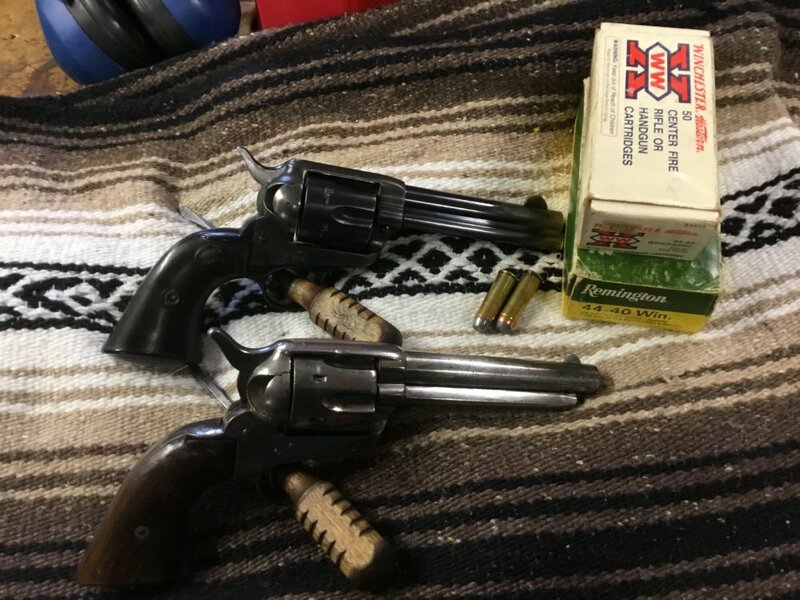 "These were designed for markets that had mostly just seen pictures of actual Colts and they made scaled-down variants chambered in 38 S&W, 38 Colt, 32 S&W and 22 LR. We have yet to see a “Mexican Colt” chambered in anything larger. " So the OP's .44-40 wouldn't fit into that description. Simply because the author of that article has never seen anything larger is moot. The physical appearance of the revolvers are almost identical so I think we can extrapolate the OP's firearm fits into this generic class of copies. At least that is what I conclude. I totally agree, Goody. The outward appearances of the pistols are remarkably similar. That's what struck me by the author of the article's statement that they had yet to see one chambered larger. 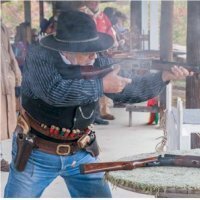 Perhaps Cypress Sam's pistol is an example that the author should check out. A very interesting pistol by any account. BTW, thanks for the link to that article. 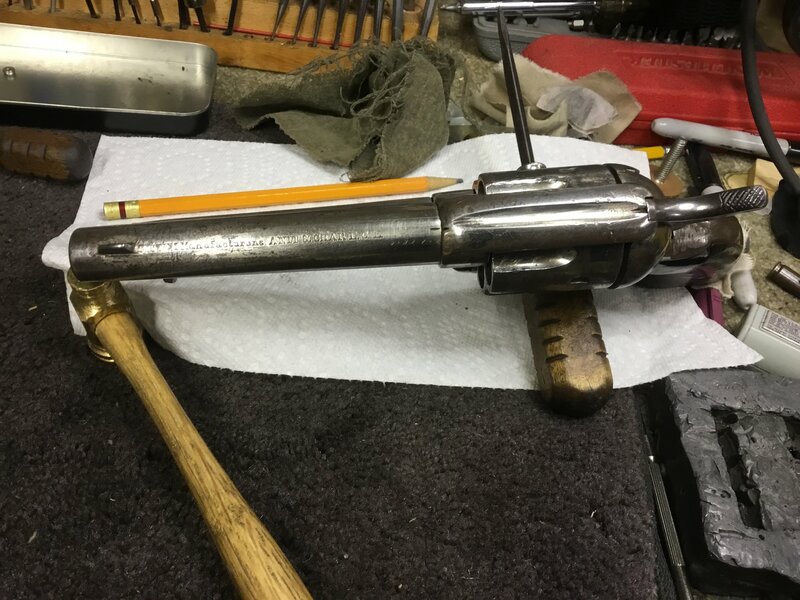 I learn something new about these old firearms every day. 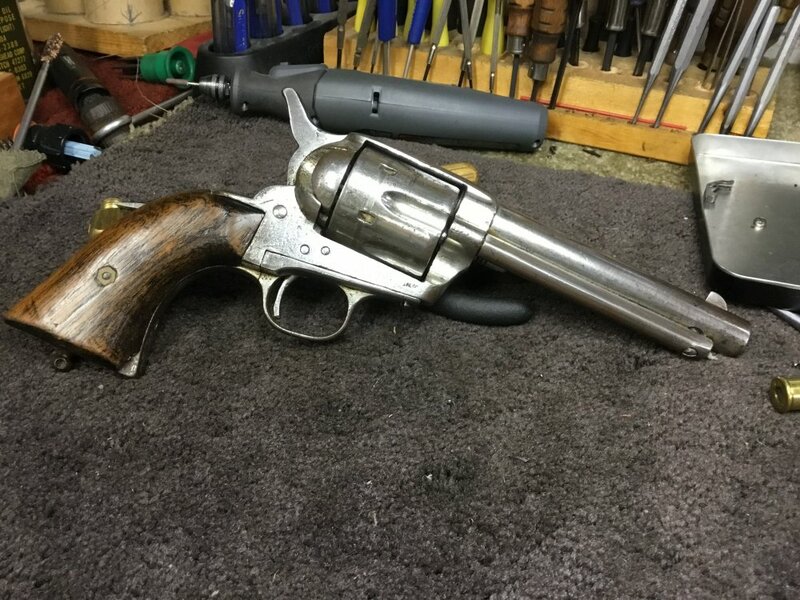 Here is the one that a local gunshop had and sold. It was the same size as a SAA and 44WCF, if I remember correctly. Thanks to Goody and Warden for good information. The article Goody posted was quite interesting. 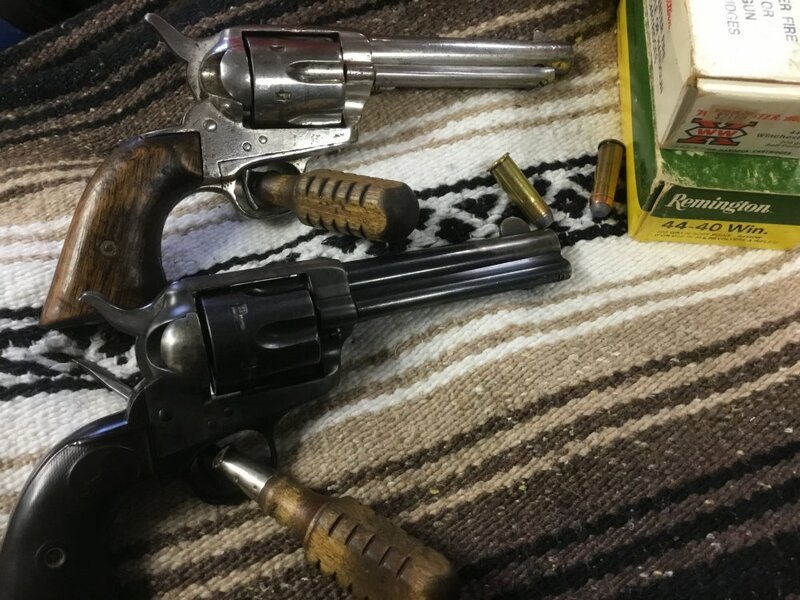 As far as caliber and frame size though, you can tell by comparison with the 1902 Colt in the pictures below that the gun is full size, not a “pocket” model. I’ve shown both guns with a factory 44-40 in the cylinder for comparing scale. Warden, do you remember if the gun in your pic had a front sight? After reading Goody’s article and looking at the front sight on my gun, it is quite possible that it has been added, or maybe the barrel has been shortened (I don’t think the bbl has been shortened though.). There are tool marks around the front sight making me think it may be a late addition. Warden﻿﻿, do you remember﻿ if the gun in your pic﻿ had a front sight﻿? I really don't remember. Does not look like it in the picture. Some more......Now I am not holding any of these up to be exactly like the OP's example. I am merely posting some more examples of the same sort of pistols made in Spain around the end of the 19th century. Many were supplied to Mexico during the many revolutions they had in that era. I find the leather covered grip especially interesting. 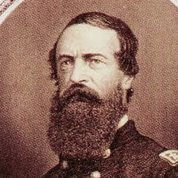 Many copies saw use in the Mexican revolutions. Thanks all y’all for the good info. The old gun is a lot more interesting than I originally thought.